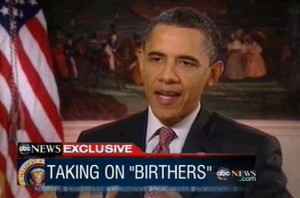 George Stephanopoulos scored a major scoop tonight by getting Barack Obama to offer his own insight on the birther controversy recently brought back into the news cycle by the presidential/promotional campaign of reality television host Donald Trump. Stephanopoulos described Obama’s reaction to being questioned about his birthplace: “He grabbed at the chance with a big smile – saying he thinks the whole issue will be a problem for Republicans. I believe that the GOP is going to have a helluva of a time trying to determine their ticket. Their field is filled with people who are coming across as individuals in need of mental health care. ...I agree. And the field is led by a rich clown, Donald Trump. Thank you for your feedback, as always.